Marconi began his research on radio waves while at home in Bologna, inspired by the possibilities he saw in the work of early pioneers such as Heinrich Hertz, Augusto Righi and Oliver Lodge. He brought his vision and his enthusiasm to England in 1896, in search of support and commercial application, and in the same year applied for a patent for a system of wireless telegraphy. Having demonstrated his system to the Navy, Army and representatives of the Post Office in trials on Salisbury Plain, Marconi arranged a demonstration to accompany a public lecture on telegraphy by William Preece, chief engineer to the General Post Office. This was held in Toynbee Hall, the educational and charitable institution in London’s East End, in December 1896. Preece operated the transmitter and whenever he created an electric spark, a bell rang on a box Marconi took to any part of the lecture room. There was no visible connection between the two. The demonstration caused a sensation and made Marconi a celebrity. 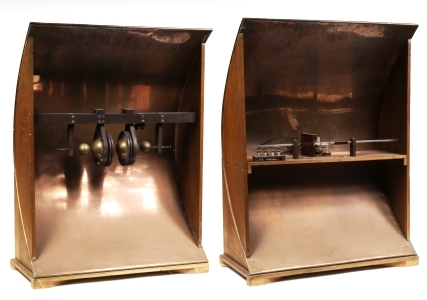 Coherer Receiver, by Guglielmo Marconi, 1896. 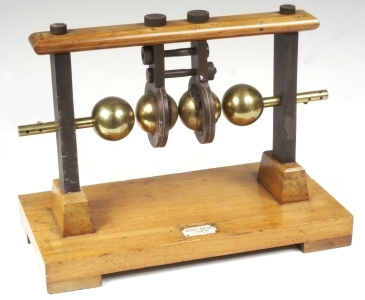 A coherer was linked to a device such as a recorder or a bell to register the signal and to a ‘tapper’. A mechanical tap to the coherer released its metal filings, making it non-conductive and ready to receive the next signal. 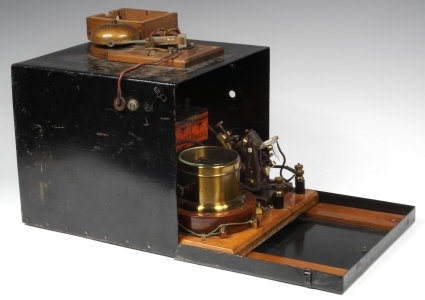 This example was used by Marconi in his famous public demonstration of wireless in London’s Toynbee Hall in 1896. The parabolic transmitter and receiver used by Marconi for his demonstration on Salisbury Plain in 1896. Marconi Collection: Inv Num 31092, Inv Num 53586. The Times of Friday, 11 June 1897 reported another lecture by Preece. was remarkable. On Salisbury Plain a distance of four miles had been covered. In the Bristol Channel the distance had been extended to over eight miles. The system was now to be put in operation officially between Sark and the other Channel Islands, and in a short time a telegraph office would be opened there and messages would be received and transmitted without the aid of any communicating wires. He believed that this new system would in the near future prove of great commercial and naval and military value. Even if it turned out that it was impossible to communicate over very long distances, could they estimate the value of the system as a means of communication between ship and ship, or ship and shore? ”Mr. Marconi briefly addressed the audience.